Betweenness is a centrality measure based on shortest paths, widely used in complex network analysis. It is computationally-expensive to exactly determine betweenness; currently the fastest-known algorithm by Brandes requires O(nm) time for unweighted graphs and O(nm + n 2logn) time for weighted graphs, where n is the number of vertices and m is the number of edges in the network. These are also the worst-case time bounds for computing the betweenness score of a single vertex. 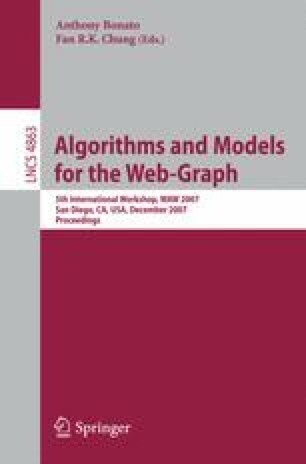 In this paper, we present a novel approximation algorithm for computing betweenness centrality of a given vertex, for both weighted and unweighted graphs. Our approximation algorithm is based on an adaptive sampling technique that significantly reduces the number of single-source shortest path computations for vertices with high centrality. We conduct an extensive experimental study on real-world graph instances, and observe that our random sampling algorithm gives very good betweenness approximations for biological networks, road networks and web crawls.